Custom imprinted classic style party sunglasses are favored by party hoppers because they can transform their appearance. These customized sunglasses hold immense ability to transform dull scene into a funky one. 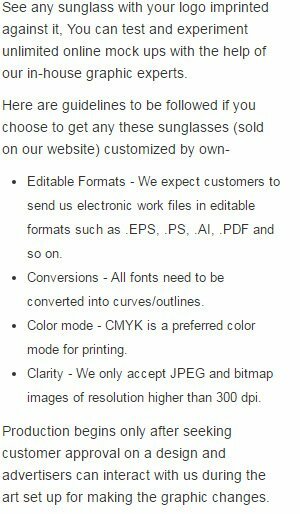 This custom classic sunglasses are offered with an option of 16 colors. Advertisers who are thinking of handing out some unique gifts during holiday season can always seek it. Available Colors: Orange with Orange, Black with Purple, Black with Red, Black with Orange, Black with Green, Black with Blue, Black with Yellow, Black with Pink, Black with White, Black with Blue, Red with Red, Navy with Navy, White with White, Pink with Pink, Black with Black, Green with Green.